Nineties supermodel Claudia Mason entered modelling's fray on the wave of the original Supers, astonishing fashion editors, designers, and photographers with her beguiling, hard to place mysterious looks. Discovered at age thirteen whilst browsing for records, Mason would play muse to a generation of photographic legends including Richard Avedon, Steven Meisel, Francesco Scavullo, Patrick Demarchelier, and Bruce Weber, landing on the pristine pages of Vogue, Harper's Bazaar, Elle, Mademoiselle, and W. Mason along with fellow compatriots Tyra Banks, Susan Holmes, Meghan Douglas, and Beverly Peele, ushered in a new breed of supermodel whose exotic beauty and runway prowess kept the fashion machine in full spin throughout the 90s. Mason's multi-racial background and love of the performing arts, saw the versatile beauty taking on a multitude of editorial roles from Gypsy Queen, Bond Girl, All-American Beauty to Gangster's Mole. Mason's modelling metamorphosis continues to this day, with the 39 year old displaying stunning form recently in editorial spreads for Twin Magazine, Love and Russian Vogue, and on the runway for Giles and Ungaro during the Spring/Summer 2011 collections. Mason took time out from her roles as model, actor and producer, to chat with Inoubliable Model Army about the late great Richard Avedon, the evolution of the modelling industry, and the fashion images from her prolific modelling career which she holds dearest. Inoubliable Model Army (IMA): Hi Claudia, thank you for taking a moment to chat with Inoubliable Model Army. You arrived on the modelling scene on the cusp of the original Supers and went onto become a regular fixture in the pages of the British, French and American editions of Vogue, Mademoiselle, and Elle. Did you realise at the time the significance of the supermodel phenomenon and what are your recollections of those early heady days? CM: No, I hadn't realised the significance of the supermodel phenomenon at the time. I was aware that something big was happening, and that I was part of it, but I hadn't grasped the greater and far-reaching significance that it held. What a great time it was! I went from Avedon's studio to Scavullo's studio to Steven Meisel's. From Patrick Demarchelier to Mario Testino's to Bruce Weber's! It was such ride for a 14 year old to embark on, and I loved it. A model is essentially a mute performer, and I do love to perform. IMA: How did you initially get into modelling and following more than two decades in the industry, do you still get a buzz turning it on for the camera and on the runway? CM: I was discovered in a music store when I was 13 years old in my hometown of Manhattan, NY. I absolutely still get a buzz in front of the camera! If it's a top creative team that I'm working with, then stand back because we are all bringing it... ! So much fun, and what's not to like about getting dolled up and pouting for the camera - ha! The runway will always be fun, cause it's the live aspect of modelling. It's a mini-theatrical event. The actor in me just loves it. IMA: Where do you hail from, what are your ethnic origins, and how did your multi-racial background impact on the course of your modelling career? CM: My background is a big NYC mix! You name it, I've probably got it. My look constantly keeps people guessing as to where I'm from, and what my background is. No one ever guesses right - funny to me. This has only helped me in the ever changing world of fashion. IMA: You have posed for many of the key figures in fashion photography; Richard Avedon, Tyen, Arthur Elgort, Marc Hispard, Max Vadukul, Bruce Weber, Patrick Demarchelier, and Sante D'Orazio. What are your fondest memories of those collaborative efforts and were there any particular photographers who you hold in high esteem on both a professional and personal level? IMA: The modelling industry has evolved hugely since those early days. What is your take on the industry today and the current generation of budding modelling stars? CM: Every business changes, as does life. The modelling industry has changed along with the times. There are more magazines, there is social media etc. Therefore there are more modelling agencies, and more models. The fashion industry and how it operates on a seasonal basis hasn't changed that much however. IMA: Following countless editorial appearances and covers for the likes of British, German and Paris Vogue, Mademoiselle, W, Harper's & Queen, Marie Claire, and so forth, is there an editorial or cover image that to this day is amongst your favourites? CM: The British Vogue cover shot by David Bailey. It was one of LIz Tilberis' favourite covers and she spoke about it in a documentary. 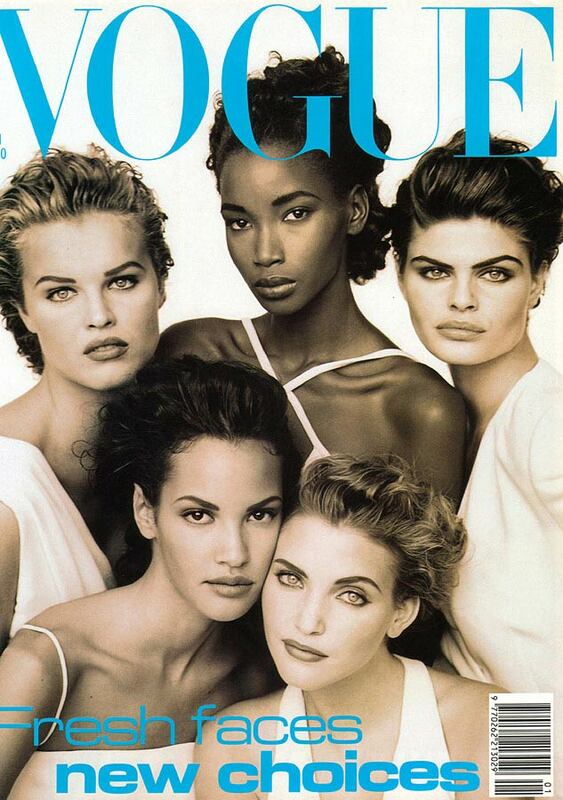 I'm also quite fond of a Spanish Vogue cover shot by Matthew Rolston. I'll always love the editorial spread I did for French Vogue with Javier Vallhonrat in Mexico, just beautiful. IMA: During the early 90s, you were often photographed with the leading models of the day including Eva Herzigova, Beverly Peele, Susan Holmes, and Meghan Douglas. Who were your closest model confidantes at the time and do you still keep in touch with each other? CM: Tyra Banks, Heather Stewart-Whyte, Meghan Douglas, Susan Holmes... yes, all good buddies of mine back then and today. IMA: You also harbour acting ambitions having studied drama in New York and have appeared on stage and on television in shows including CSI: NY, How I met you Mother, in addition to guest cameos on Kitchen Confidential and America's Next Top Model. Have your modelling endeavours prepared you for the fiercely competitive field of acting and do you feel their are similarities between the two disciplines? CM: Yes, there are similarities between the two. One is performing when one is modelling, just like actors do. However, there is the craft of acting, one has to speak while acting, as opposed to not when modelling, for example. I very much enjoy being an actor today, as well as a model, producer, and writer. I enjoy working in films as well as TV and stage. IMA: During the Spring/Summer 2011 season, you returned to the runway to walk exclusively for Giles and Emanuel Ungaro. How did it feel to be back on the runway and were you able to offer any words of advice backstage to your younger compatriots? CM: It was fun! A fashion show is a performance and as I've said, I do love to perform. IMA: You recently appeared in editorial spreads for Love, Twin Magazine and Russian Vogue, shot respectively by Angelo Pennetta, Will Davidson, and Willy Vanderperre. Is the process of collaboration different amongst the new generation of photographers as compared to when you started out in the industry? CM: No. There was however a fantastic opportunity with the Twin Magazine shoot, to really express myself artistically as an actress/dancer in the shoot and that was extraordinary. As a model you don't have those artistic collaborations every day with the photographers you work with. Will (Davidson) and I had the best time creating this magical dance of an editorial. The 3 male dancers that were in the shoot with me were just fantastic. I thoroughly enjoyed it. IMA: When you look back on your years in the modelling industry, what do you feel are the most valuable life lessons that you have gained as a result of your experiences? CM: Strength, courage, faith. Rolling with it all, as it's such a fantastic opportunity for a girl to see the world and meet many amazing people from many different industries besides fashion, as you are exposed to the world. What a fantastic education indeed.